The past month has been very chaotic here as my son turned one near the end of November. While we have continued the Chicken Monday tradition at our table, my recipes have not found their way to my blog. My apologies to all of my readers! Here is a recipe that I made several weeks ago and is one of those tried-and-true easy favorites that can be made on a whim and is sure to please a diverse crowd. Any time I see the words “chicken” and “bake” in the title of a recipe I get excited because the steps are usually easy, the house usually smells wonderful during the cooking time and the results are usually top notch. This recipe comes from the The Ultimate Southern Living Cookbook, edited by Julie Fisher Gunter. 2.) Bake, uncovered, at 350 F for 30 minutes, basting occasionally. 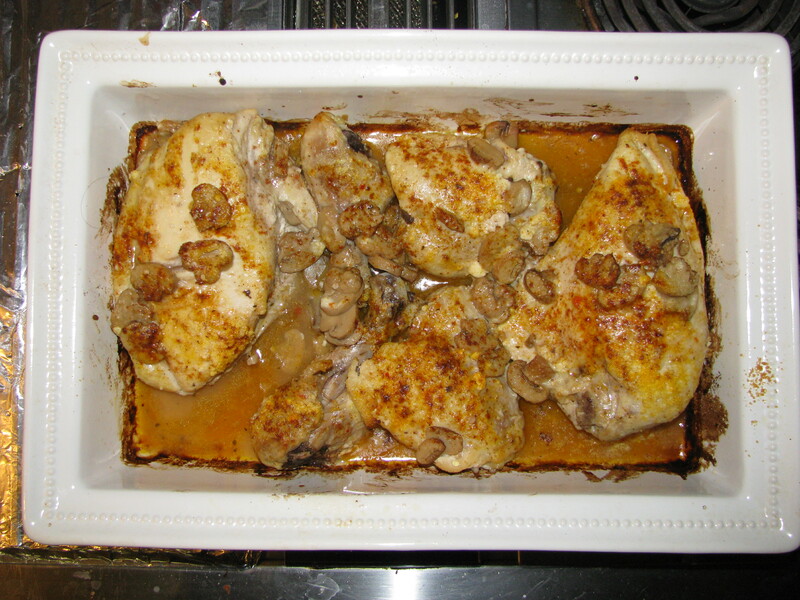 Turn chicken, and add the mushrooms; sprinkle with Parmesan cheese and remaining 1/4 tsp paprika. Bake 30 minutes more or until chicken is tender. The finished product, directly from the oven. When the chicken is finished, it will be moist and surprisingly flavorful – more so than expected due to the few ingredients. The Parmesan cheese forms a lovely crust, which replaces the lost skin and adds the perfect amount of saltiness to the dish. I have made this recipe before and it can be served with any number of sides. My favorites are rice and broccoli. Other favorites are buttered egg noodles, mixed veggies or even mashed potatoes (white or sweet). One change I will make next time I make this dish is to line the baking dish with foil first to make cleanup a little easier. The leftovers (if there are any!) keep very well and the chicken will shred nicely to put over a salad or make into a sandwich. Enjoy this comforting meal and you can look forward to another recipe next week – Chicken Monday has returned!